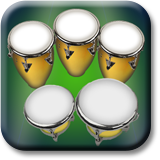 Bongo Conga Drum Band - check it out today! Drum for fun with Bongo Conga Drum Band! Relieve stress, improve motor skills, or annoy others when you tap on these Big and Bold colored drums. Comes with 6 Bonus percussion instruments for even more fun: wood block, cowbell, maracas, tambourine, guiro, and agogo. Change the color of the drums or background whenever you want. Watch the instruments shake or light up when you tap on them. Move instruments around to create new sounds and save your personal layout for the next time you play. And it comes with background beats too. So drum for fun with Bongo Conga Drum Band! Move and overlap instruments to create new sounds. Tap in the overlap area to play multiple instruments at once. Or play each instrument separately by tapping in the non-overlapping area. Want help playing a steady beat? Press and hold down on a bongo or conga to create a steady beat. To change the tempo, press and hold down on on the Beat button & adjust the tempo slider when it appears. Select one of the background beats by tapping on the Settings button. Then tap on the first line in Settings and select a beat from the drop down menu. Now, turn on the beat you selected by tapping on the Beat button. Works great with the speaker or use headphones to fully enjoy the high quality instrument sounds.